The Morning After | Food and Drink | Style Weekly - Richmond, VA local news, arts, and events. Brunch makes Sunday more tolerable. Here are some of Richmond's best spots. 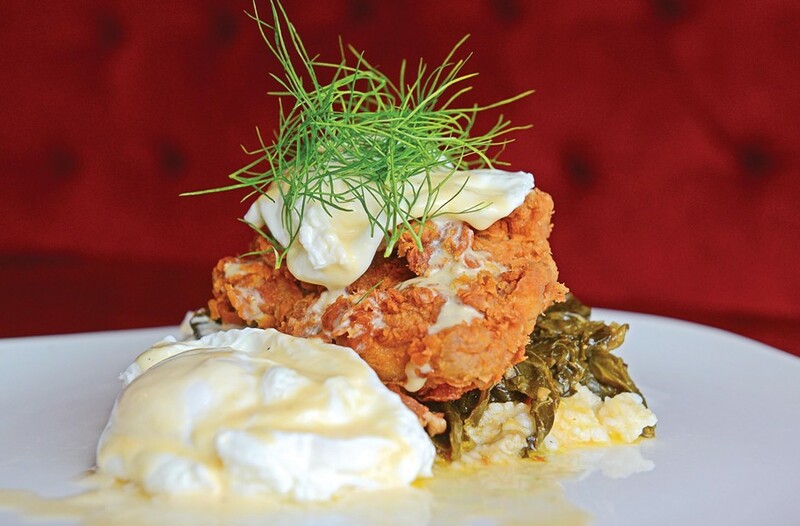 For Sunday brunch at the Magpie in Carver, chef Owen Lane prepares luscious specials such as chicken-fried pheasant with sweet collards and poached eggs. Richmond and brunch can be Shakespearian — star-crossed and occasionally tragic. It's extraordinary how one meal can be so revered and yet so despised. Most chefs are done after a hard-fought Saturday night, so the idea of returning to a restaurant Sunday morning to whip up a creative eggs Benny can be cruel. Conversely, Richmonders battle Saturday night in a completely different way, and as a consolation prize, we want waffles. This city loves brunch too hard. But with food like this, we're winning. The Magpie has a low-key brunch without fear of the same old, because the menu changes frequently. A recent star is chicken-fried pheasant with sweet collards topped with beautifully poached eggs. Starters to pair with your Belgian mimosa — Hardywood Singel and orange juice — are the bacon hush puppies with the right amount of salt and corn sugar. Crème brûlée French toast is sharable, sweet enough to retire you to the couch for the remainder of the day of rest. Sunday brunch: 10:30 a.m.-2:30 p.m.
Belle Vie, a Belgian restaurant south of the river, keeps brunch formal yet inviting. A gargantuan slice of airy quiche ($9.50) is too much for one person but too good to share with its melted Gruyere and leeks. Belgian waffles — actually Brussels-style — are thinner, denser and chewier than usual with their caramelized edges and yeasty undertones. Warm chicken livers ($11.95) are brilliant on a fresh lettuce salad with cream and balsamic vinegar additions. Sunday brunch: 11 a.m. - 2:30 p.m. While lunch is a perfectly acceptable reason to head to Lunch in Scott's Addition, breakfast every day is even better. Immense fluffy buttermilk biscuits covered in sausage, egg and cheese are smothered in heady gravy and appropriately called the train wreck ($8.50). Massive slices of crusty French toast ($7) are slathered with Nutella and whipped cream. The Lunch skillet ($10), a special, deftly combines eggs, homemade sausage, peppers, onions, crisp potatoes and cheddar and is happily absent of any diner greasiness. Breakfast daily 10 a.m. - 3 p.m.
Aziza's has a big brunch with typical features such as a three-egg omelet ($10) with a choice of fillings — Italian sausage and roasted peppers make a winning combination. Atypical options rotate weekly in the form of new chef Philip Denny's specials. Gritty skillet cheddar corn bread ($12) is a good base for a heaping pile of pulled pork and hollandaise with a peppy jalapeño spice. A recent special is revelatory: potato gnocchi, braised duck legs, a sunny-side up duck egg and foie gras sauce. Morning, afternoon or night, always save room for Rusty's cream puff ($5). Heritage, a newer addition to the Fan, is packed during brunch hours with patrons clamoring for hair of the dog, though die-hard fans of the big hot mess ($12) should be able to slide into a seat later in the day. Cheesy potatoes meet pulled-pork barbecue or pork belly — on the chef's whim — and smartly runny eggs in this jalapeño-mayonnaise-laced dish of organized chaos. A riff on chicken and waffles ($11) has honey cut with a pop of spice. Side eggs any way ($3) and house-made bacon ($3) make a case for going out instead of messing up the kitchen at home. Sunday brunch: 10:30 a.m. - 3:30 p.m.